This Applet will help you find out where in your MASM (Microsoft Assembler) Microsoft *.asm assembler program you have mismatched segment/ends macro/endm proc/endp or if/endif. It works by displaying your program in tidied form with coloured backgrounds that encode the nesting. By eyeballing the colours, you can quickly see anomalous patterns and find where the problem is. It does not modify your original program in any way. You copy/paste a program, or a piece of a program, into this Applet/application hybrid then click Paste. There is a program called BraceBalancer that does an analogous task for Java, C, C++, Pascal, Modula, CSS (Cascading Style Sheets) etc. There is also a tidy program for MASM that aligns your code in four neat columns called MASMTidy. Copy MASM source code with possibly unbalanced segment/ends, macro/endm, proc/endp or if/endif into the clipboard from your editor or IDE (Integrated Development Environment). In Windows use Ctrl-C.
Then click Paste to paste it into this program. Anomalies in the background colours of the operators should help you quickly find the error. Due to a bug in Oracle’s code that I cannot figure out how to bypass, if you move away from this page in your browser and come back, this Applet will no longer work. You must exit the browser and restart to make it work again. Bright yellow: you have more end markers than start markers, e.g. more endifs than ifs, in other words negative nesting. This is always an error. Red: indicates struct-ends nesting. The lighter the red, the higher the level, i.e. not as deep nesting. Green: indicates macro-endm nesting. The lighter the green, the higher the level, i.e. not as deep nesting. Violet/blue indicates proc-end nesting. The lighter the violet, the higher the level, i.e. not as deep nesting. Grey indicates if-endif nesting. The lighter the grey, the higher the level, i.e. not as deep nesting. When you select separate balancing you will also see | markers in the left margin to indicate nesting depth. The MASMBalancer program works by marking up your program with HTML (Hypertext Markup Language). Java has quite a few bugs rendering HTML. You may notice lines improperly collapsed together. To view the marked up code accurately, use the export button, export to a *.html file and view it with your browser. For this Applet hybrid to work, you must click grant/accept/always run on this site/I accept the risk to give it permission to allow MASMBalancer to accept data from the clipboard. If you refuse to grant permission, the program may crash with an inscrutable stack dump on the console complaining about AccessController.checkPermission. for the current version of MASMBalancer. MASMBalancer helps find unbalanced segment/ends macro/endm proc/endp if/endif in Microsoft *.asm assembler source code. 1,431K zip for MASMBalancer Java source, compiled class files, jar and documentation to run on your own machine either as an application or an Applet. access masmbalancer source in repository with [Tortoise] Subversion client on wush.net/svn/mindprod/com/mindprod/masmbalancer/. 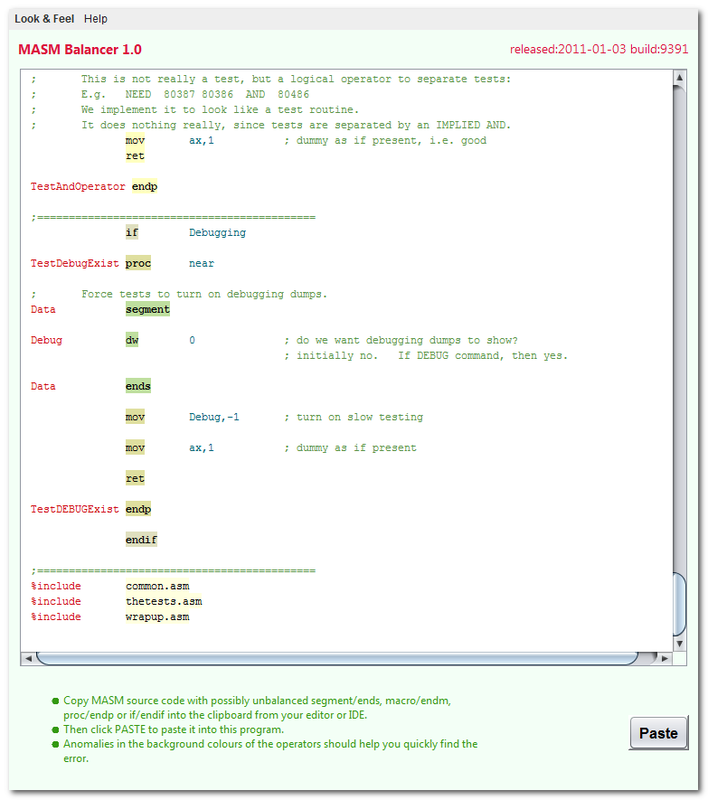 download ASP PAD XML program description for the current version of MASMBalancer. MASMBalancer is free. Full source included. You may even include the source code, modified or unmodified in free/commercial open source/proprietary programs that you write and distribute. Non-military use only.